Just a brief realization I hadn't previously thought of: as pointed out by Kris Tapley over at Red Carpet District, Oscar nomination ballots were due yesterday, so the Golden Globe winners will have NO effect whatsoever on who gets nominated for Academy Awards. They may point voters in certain directions when they are voting for winners, but they cannot influence the nominations. So where does that leave Atonement? The Hollywood Foreign Press Association in no way reflects the opinions of Oscar voters, because Oscar voters are the people who make the movies - the insiders. The HFPA are all foreign journalists, and they couldn't be further Academy voting body. In other words, Atonement still isn't a slam dunk. It's Golden Globe win may be an omen, but its win here may be too little, too late. 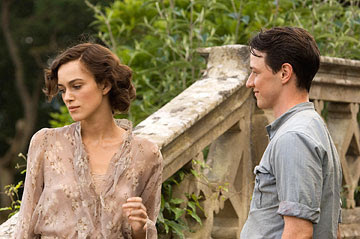 If anything I think having Atonement win the Globe is actually good for No Country. No Country has just been too hot for it's own good and I think with a Globe win some of the AMPAS members would've looked down on it and wanted to go a different way to prove they're better than the HFPA. This is pure speculation on my part based on not knowing a single AMPAS member, but if it's true the Globe loss is only good for No Country when it comes time to pick the winner (assuming it's even nominated).